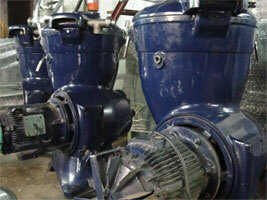 we specialise in the repair and maintenance of all makes of industrial decantor centrifuges Bowls and conveyors & also related equipment for the process industries. 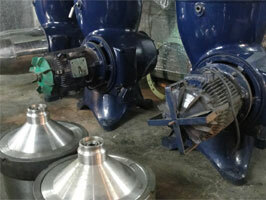 Our repair shop is equipped for scroll hard surfacing, gearbox repair and testing, scroll, bowl and gearbox balancing. We also offer complete frame refurbishing as well as repair of damaged and worn parts. We have in-house Balancing facility for balancing the same. we specialise in the repair and maintenance of all makes of industrial decantor centrifuges and related equipment for the process industries. We have a team with fully trained and experienced technicians to meet your high-speed and decanter service needs. We also offer training programs, and preventative maintenance programs, for basic training of operation, vibration monitoring & periodical preventive maintenance plan for all type of rotating equipments including all types of Centrifuges.